A senior Asian Development Bank official said Wednesday that NGOs will continue working with villagers being relocated by a massive railway project, following the leak of a government letter seeking to shut them down. In a June 17 letter to Prime Minister Hun Sen obtained by VOA Khmer, Finance Minister Keat Chhon suggested the government “nullify the eligibility” of NGOs advocating for the rights of villagers who could lose their land in the project. “The main goal of these NGOs is to cancel the construction of the railway,” the letter said. Keat Chhon could not be reached for comment Wednesday, and a Finance Ministry official said he had “no idea” about the letter, which has Keat Chhon’s signature. The Asian Development bank is supporting a $146-million project that would rehabilitate Cambodia’s railways to help connect Asean countries to Kunming, China. Thousands of people will have to be relocated as a result. 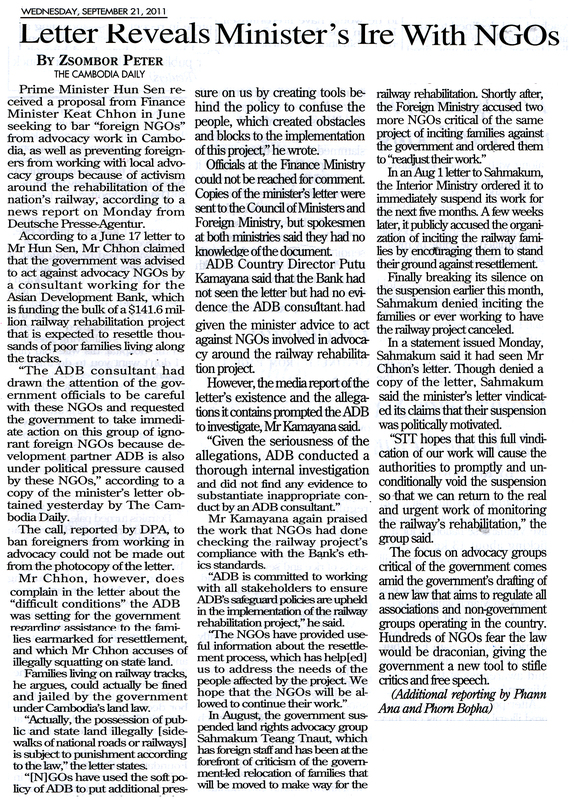 “ADB hopes the NGOs will be allowed to continue their work on the railway project,” he said. In the weeks following the letter, one NGO working closely with residents along the railway, Sahmakum Teang Tnaut, was suspended by the Ministry of Interior and another, Bridges Across Borders, received a reprimand from the Ministry of Foreign Affairs. A French Embassy spokeswoman declined to comment on the letter. Land-Rights NGO Sahmakum Teang Tnaut yesterday called on authorities to “promptly and unconditionally” allow it to return to its work monitoring the rehabilitation of the country’s railways, following a report it said fully vindicated its claim that its August 2 suspension by the Ministry of Interior was politically motivated. 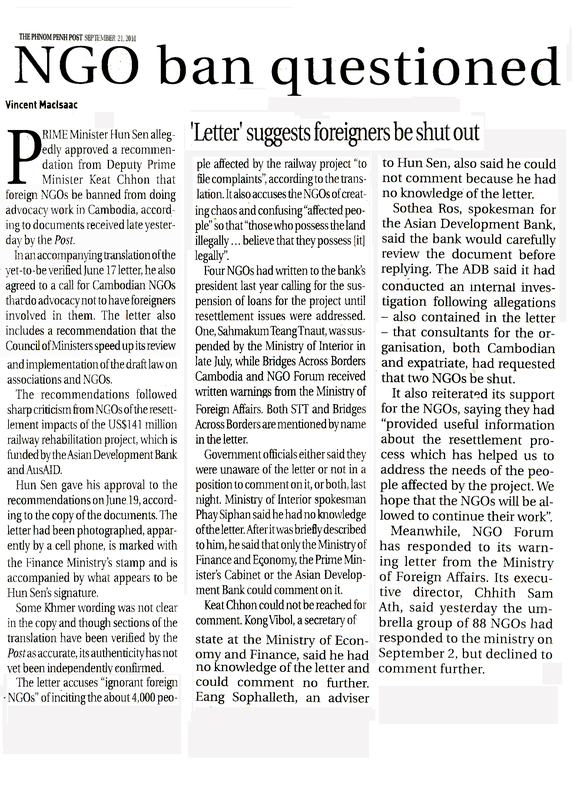 The report by news agency Deutsche Presse-Agentur cited a June 17 letter from Minister of Economy and Finance Keat Chhon to Prime Minister Hun Sen in which an unidentified ADB consultant allegedly asked the government to take action against STT and NGO Bridges Across Borders Cambodia because the ADB was under pressure from them over its funding of the railway project. A June 17 letter from the Ministry of Economy and Finance is referred to in the suspension letter sent to STT from the interior ministry, but the Post could not confirm its contents. STT, however, said yesterday, that the “letter was first shown to us, and parts of it read to us, during a meeting with the Ministry of Interior in July”. A spokesperson for STT said the letter was “also referred to in official meeting minutes from our meeting with the MoI”, but said its request for a copy of it had been denied. When asked to comment Interior Ministry spokesman Khieu Sopheak said STT’s suspension was “old news”. He also said it was not his responsibility to comment on any letter from a different ministry, but added that any NGO that wanted to work in Cambodia had to “act according to Cambodian law”. STT said “other accusations made against us [by the interior ministry] concerning administrative details are not only incorrect, but were used by the government as pretexts to obfuscate the facts and to silence us”. 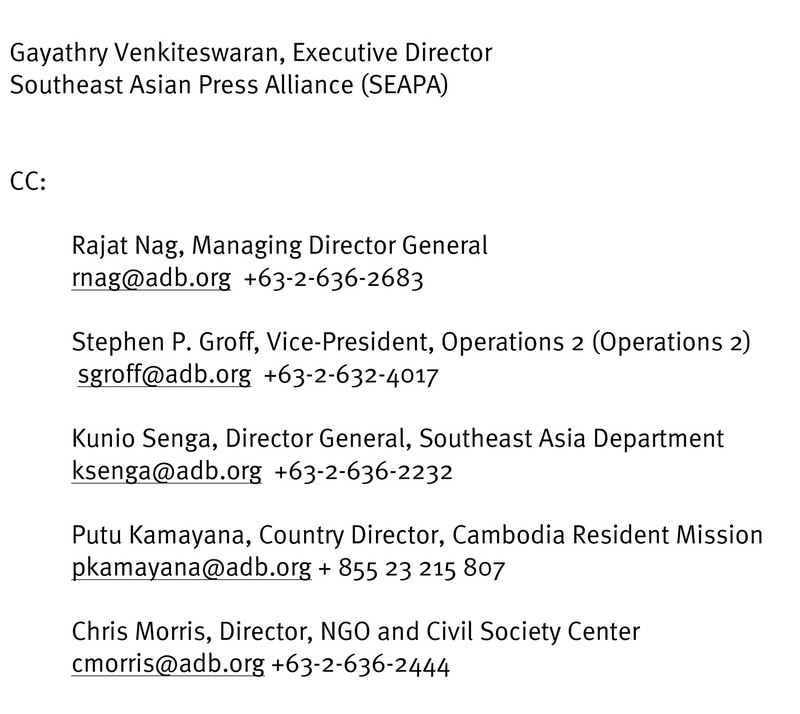 It said the June letter also “reveals a deeply concerning action by a consultant of one of the most influential institutions in the region”, referring to the ADB. ADB country director Putu Kamayana, however, said: “ADB does not have a copy of the alleged letter … and since we do not have a copy … was unable to verify the accuracy of a translation [it was given].” “Nonetheless, given the seriousness of the allegations, ADB conducted a thorough internal investigation and did not find any evidence to substantiate inappropriate conduct by an ADB consultant. The NGOs were unable to provide any more information on the alleged statements by the consultants. We have met them numerous times to discuss these issues,” he said. Click here to listen to ABC Radio Australia’s Sep. 6 Asia Connect broadcast with a feature on the recent crackdown on Cambodian NGO’s monitoring the resettlement impacts of the ADB and AusAID financed railways rehabilitation. The Asian Development Bank said yesterday problems with a railway rehabilitation project – funded by the bank and AusAID – identified by a local NGO that was suspended by the government last month “may require further investigation or analysis”. Last month, the government suspended the operations of local NGO Sahmakum Teang Tnaut, which released a report in July that was critical of the project. 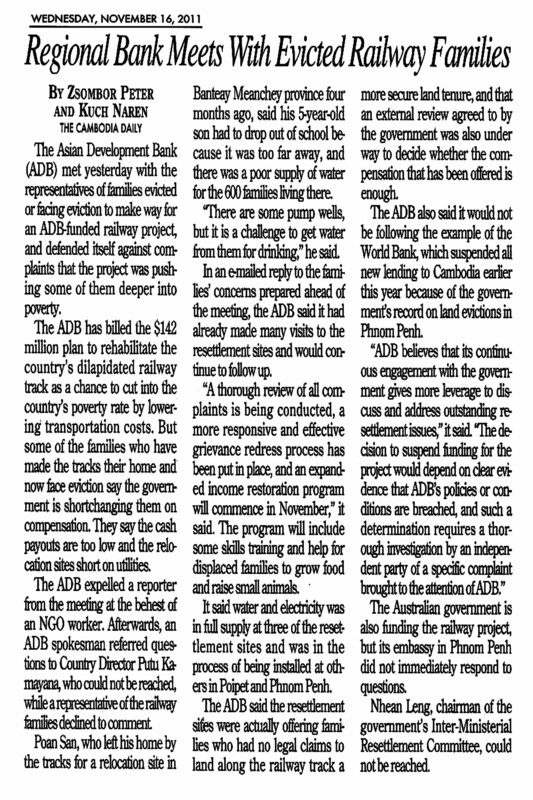 “In monitoring the implementation of resettlement under the project, STT identified issues and procedures that could be improved and, in some cases, may require further investigation or analysis,” Asian Development Bank country director Putu Kamayana said in an email yesterday. He added that ADB reviews “have found that the living allowance set forth under the original Resettlement Plan is now insufficient due to rising food prices in recent years”. In July, STT released a report stating that compensation for villagers in four communities in the capital affected by the project might be insufficient due to a “systematic downgrade” of the value of their homes by the government. STT director Ee Sarom said by email yesterday that officials from the Ministry of Interior had said during meetings that the NGO’s suspension last month was “directly related” to its work with residents affected by the railway project. The ministry had previously accused STT of “inciting villagers” to rally against the railway project with the aim of causing development partners to “suspend” it. STT defended its work, saying it was focused on “ensuring that affected households are not harmed” and had “never called for the railways rehabilitation project to be cancelled”. Kamayana, however, said yesterday the government had informed the bank that the suspension of STT was “unrelated” to its railway monitoring work. Interior Ministry secretary of state Nouth Sa An and spokesman Khieu Sopheak could not be reached for comment yesterday. Rights groups have claimed that STT’s suspension offers a preview of what will happen if the government enacts a controversial law on assoc-iations and NGOs operating in the Kingdom. Meanwhile, civil society groups said in a statement yesterday that residents affected by the railway development feared the loss of NGOs working on the project amid “mounting pressure” from the government. 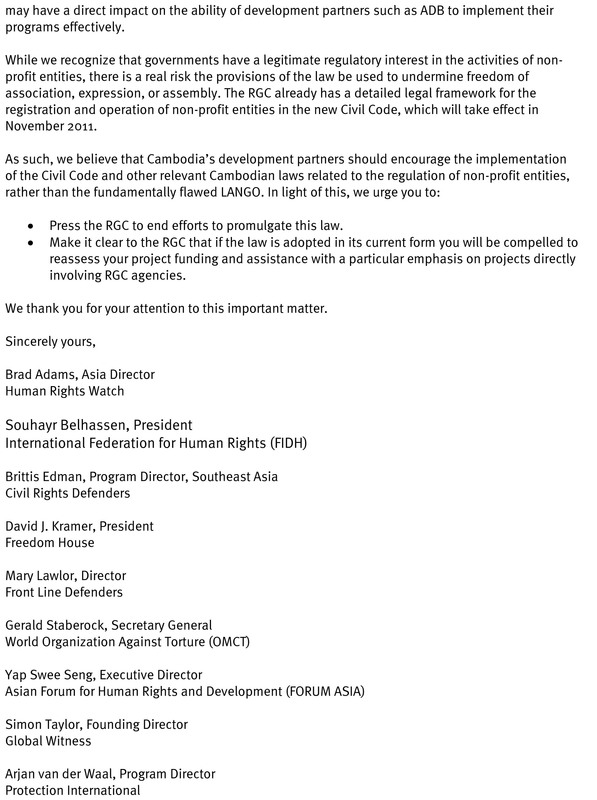 Housing Rights Task Force, Bridges Across Borders Cambodia and STT said STT’s suspension, as well as warning letters issued by the Foreign Affairs Ministry to Bridges Across Borders Cambodia and NGO Forum last month, were “likely to be detrimental to the project”. “The affected people living along the railway tracks are increasingly scared and fear that, without the work of the NGOs monitoring the project, safeguard violations will remain unaddressed,” the statement read. The organis-ations emphasised, however, that they were “not against” the railway project. 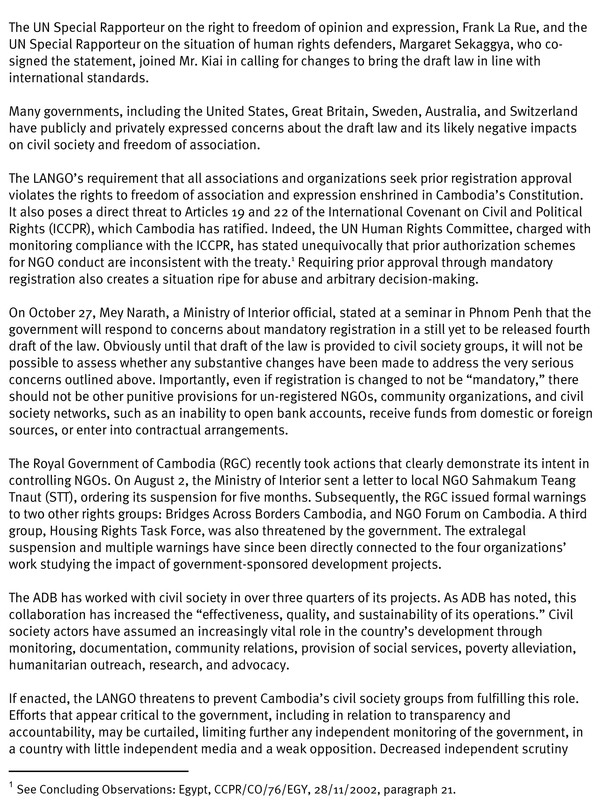 “We support all development projects that reduce poverty and fulfil the human rights of the Cambodian people,” the release said. Council of Ministers spokesman Phay Siphan and Foreign Affairs Ministry spokesman Koy Kuong could not be reached for comment late yesterday. 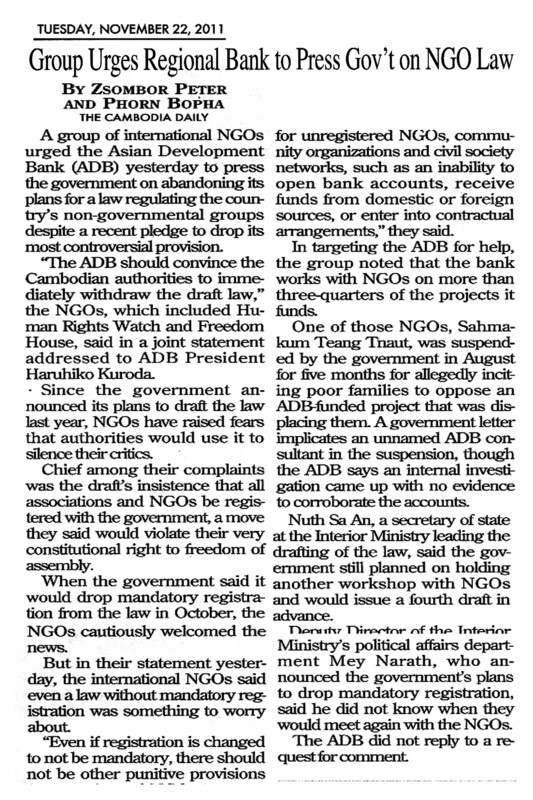 Eang Vuthy, a program manager at Bridges Across Borders Cambodia, said yesterday the ADB should urge the government to retract its accusations against the organisations and remove STT’s suspension. 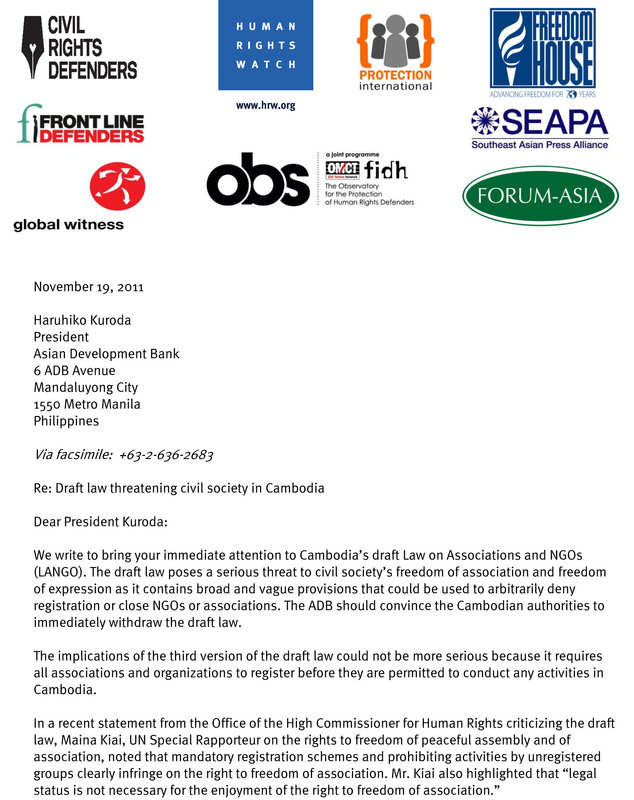 “ADB has to take a further step to make sure … that STT’s suspension is reversed. They have to make sure that these people, these NGOs, can carry out their work independently, without interference and without accusat-ions,” Eang Vuthy said. In an August 18 letter, Kamayana stated that he hoped NGOs would continue their work on the project and said STT had provided “important information” regarding resettlement for affected families.